Two recent sheriff elections in North Carolina have focused a spotlight on the growing controversy over the 287(g) program, named for the provision Congress added to the U.S. Immigration and Nationality Act in 1996 authorizing the Department of Homeland Security to contract with state and local law enforcement agencies to enforce federal immigration law. The program has come under criticism from immigrant rights advocates and some law enforcement professionals who say it harms public safety by making immigrants afraid to interact with police. It's also costly to local taxpayers, with a 2010 University of North Carolina study estimating its price per county at about $5 million annually. The outcome of the recent sheriff races, in which pro-287(g) incumbents lost to anti-287(g) challengers, suggest voters — at least those who cast ballots for Democrats — are growing increasingly reluctant to have their communities involved. In Durham County's May 8 Democratic primary, 287(g) opponent Clarence Birkhead defeated incumbent Sheriff Mike Andrews, who had promised to continue honoring Immigration and Customs Enforcement detainers — written requests for local jails to detain prisoners for an additional 48 hours to give ICE agents time to decide whether to take them into federal custody for removal proceedings. Though no Republicans filed for the office before the primary, a sheriff's department major has since declared his intention to run as a write-in candidate to oppose what he calls "radicals pushing [an] agenda." And in Mecklenburg County, which encompasses the city of Charlotte, 287(g) opponent Garry McFadden won the May 8 Democratic primary for sheriff in a landslide, defeating current Sheriff Irwin Carmichael, who has defended the program. No Republicans have filed for the office, meaning McFadden run unopposed in November barring any write-in bids. Immigrant rights advocates credited Latino voters for McFadden's victory. Mecklenburg County played a key role in a controversial expansion of the 287(g) program. In 2006, then-Sheriff Jim Pendergraph, a Democrat at the time, became the first to extend the program by allowing his officers to screen for civil violations of immigration law. The following year, Pendergraph became chief of ICE's Office of State and Local Coordination and expanded the model to other communities in the South and beyond. He resigned in 2008. In 2012, under President Obama, ICE discontinued its agreements under the task force model amid concerns over racial profiling. For example, the U.S. Department of Justice filed a lawsuit that year against North Carolina's Alamance County over racial profiling in its 287(g) program, ending its involvement. Participation in the program fell from 72 localities in 2011 to 37 in March 2017. But President Trump issued an executive order last year instructing DHS to build more 287(g) partnerships. 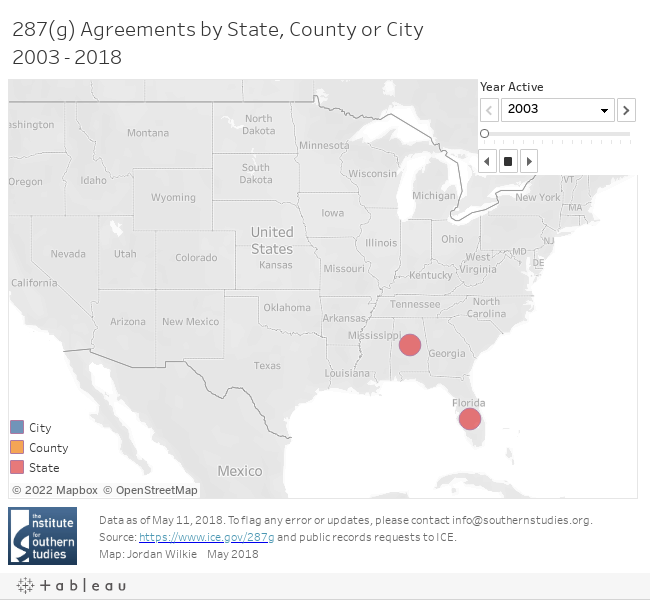 As a result, the number of 287(g) agreements nearly doubled, with more pending review. Today, 78 local law enforcement agencies in 20 states participate in the program, which led to the deportation of almost 6,000 people last year alone. Because of the wording of Trump's order, some observers have predicted that he plans to reinstate the more aggressive task force approach. That's piqued the interests of sheriffs like P.J. Tanner of Beaufort County, South Carolina, who applied to join the 287(g) program specifically to revive the task force model. Has your state or local community been involved in the program? This map, created by Facing South intern Jordan Wilkie, shows which jurisdictions have been involved over time.